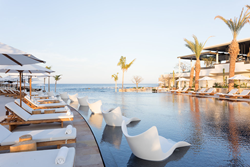 Chileno Bay Resort & Residences, an Auberge Resorts Collection property and Los Cabos' newest beachfront resort, announces an occasion to break out the Casamigos tequila - the appointment of Eliezer Quinones as general manager. Since opening its doors in February 2017, the contemporary resort has set itself apart by instilling a free-spirited energy throughout the quintessential luxury resort experience. Named as one of the top 52 places to visit in 2018 by The New York Times, the resort has more reason to celebrate with Quinones joining as general manager. A former professional baseball player, Quinones has an innate understanding of the power of teamwork, a fiercely competitive nature and a goal-oriented character that he brings to his new leadership role overseeing the team at Chileno Bay Resort. "From a freshly shaken Chilenito cocktail prepared in-room upon arrival, to a lively game of loteria with the sociable servers at TnT, the spirit of Chileno Bay Resort & Residences is fostered by our charismatic team members who bring the resort's playful energy and Latin charm to life in spontaneous ways," said Craig Reid, president and chief executive officer, Auberge Resorts Collection. "Eliezer has a captivating personality and a passion for helping people that when paired with his love for Cabo and active pursuits, make him a perfect fit to lead the Chileno Bay team." Fueled by a desire to find the opportunity hidden in every challenge, Quinones has found success in both professional baseball and the hospitality industry. Prior to joining Auberge Resorts, Quinones was general manager at Tafer Resorts' two Puerto Vallarta, Mexico properties. Previously he was at Capella Hotels and Resorts where he managed properties in Zihuantanejo and Los Cabos, Mexico, playing a significant role in the pre-opening and launch of the brand's first residential hotel project in Mexico. Early in his career, he worked with The Ritz-Carlton Hotel Company, where he quickly rose through the ranks taking positions in Las Vegas, St. Thomas, Jamaica, Puerto Rico and Cancun. Moving to Los Cabos with his wife and two daughters to accept his new leadership role with Auberge Resorts, Quinones joins the owners of residences at Chileno Bay Resort and nearby Discovery Land Company's Chileno Bay Club to call Cabo's most celebrated coast his home. "As a former professional athlete, I thrive when surrounded by boundless energy and engaging personalities - two qualities inherent in our slice of beachfront paradise," said Eliezer Quinones, general manager, Chileno Bay Resort & Residences. "I am honored to call this vibrant team my new family and be able to take advantage of the active lifestyle here in Chileno Bay. From riding Schiller water bikes in the ocean, to snorkeling through the stunning coral reefs of our protected cove, to an afternoon hike with breathtaking views of Land's End point - life here in Cabo offers endless ways to make the most of every day." Quinones graduated from Tulane University, New Orleans, Louisiana, with a Bachelor of Arts, Communications. He transitioned into baseball's minor leagues following college where he had the opportunity to play for four years with the Cincinnati Reds organization. His interest in hospitality was first piqued during off-season runs along the beaches of Isla Verde, Puerto Rico, where he became intrigued and enamored with the hotels that lined the coast. Chileno Bay Resorts & Residences opened its doors February 2017, ushering in a new expression of contemporary luxury to the Cabo landscape. Managed by Auberge Resorts Collection, acclaimed owner and operator of boutique luxury hotels, resorts, residences and private clubs, the resort is set on Chileno Bay, the most coveted swimmable beach in Los Cabos offering guests an unmatched location for spending the day with family and friends. For more information or reservations, please visit https://chilenobay.aubergeresorts.com, or call 1-855-452-6326. Auberge Resorts Collection owns and operates a portfolio of exceptional hotels, resorts, residences, and private clubs. While Auberge nurtures the individuality of each property, all share a crafted approach to luxury that is expressed through captivating design, exceptional cuisine and spas, and gracious yet unobtrusive service. Properties in the Auberge Resorts Collection include: Auberge du Soleil, Calistoga Ranch and Solage, Napa Valley; Esperanza and Chileno Bay, Los Cabos, Mexico; Hotel Jerome, Aspen; Malliouhana, Anguilla; Nanuku, Fiji; Hotel Madeline and Element 52, Telluride, Colorado. ; Hacienda AltaGracia, Costa Rica; Mukul, Guacalito, Nicaragua; and Auberge Beach Residences and Spa Fort Lauderdale (opening Spring 2018), Bishop's Lodge (opening Autumn 2018), Lodge at Blue Sky, Utah (opening Winter 2018-2019) and Commodore Perry Estate, Austin (opening 2019), with several others in development. For more information about Auberge Resorts Collection, please visit http://www.aubergeresorts.com/. Follow Auberge Resorts Collection on Facebook at facebook.com/AubergeResorts and on Twitter and Instagram at @AubergeResorts. The Friedkin Group is comprised of a consortium of automotive, hospitality, entertainment, golf and adventure companies. These organizations include: Gulf States Toyota, GSFSGroup, GSM, US AutoLogistics, Ascent Automotive Group, Auberge Resorts Collection, Imperative Entertainment, 30WEST, Diamond Creek Golf Club, Congaree and Legendary Adventures. The Friedkin Group is led by Chairman and CEO Dan Friedkin. For more information, visit http://www.friedkin.com.